Balcony of an East London high-rise. Braving the crazy wind, the coals in the kettle BBQ glow a deep orange. Lamb chops, chicken sashliks and chicken wings are fighting for grilling space. It's a Friday, the day had been hot and sunny and the balmy evening perfect for a BBQ. Some friends gather and an impromptu party starts. Sounds of laughter and chatter drift out into the quiet neighbourhood. The sun lazily sets in the horizon, streaking the sky pink and lingering for the longest time. 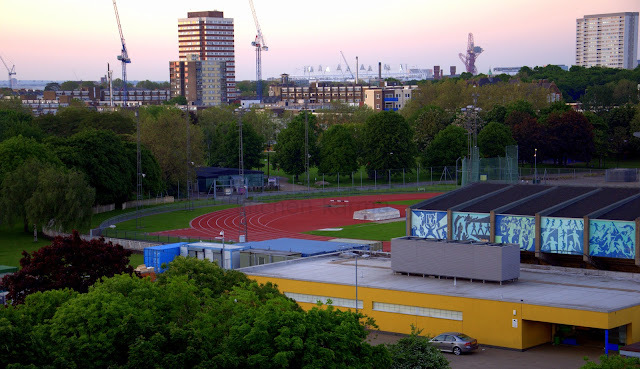 The newly built Olympic racing tracks glow in the last rays of the sun. A hot Sunday afternoon spent fighting the weeds in the small patch, which they proudly call their garden. In the late afternoon they involuntarily light the BBQ. It is too perfect an evening to miss out on BBQ-ing. Londoners do not take chances with good weather, nor do they take them for granted. So on days when the sun does come out, they celebrate that sunny day whole heartedly. And if by weather God's grace that day coincides with the weekend, then it seems like each and every Londoner has won the Lotto. No, make it the Lotto and the National Lottery and every horse race from England to Ireland. They, meaning the good people of London, spend the whole day outdoors in parks, gardens, meadows, beaches, riverside, poolside and most of them BBQ bits and pieces of meat. So like true Londoners they, meaning the weed fighters, also light the BBQ and proceed to grill some meat. 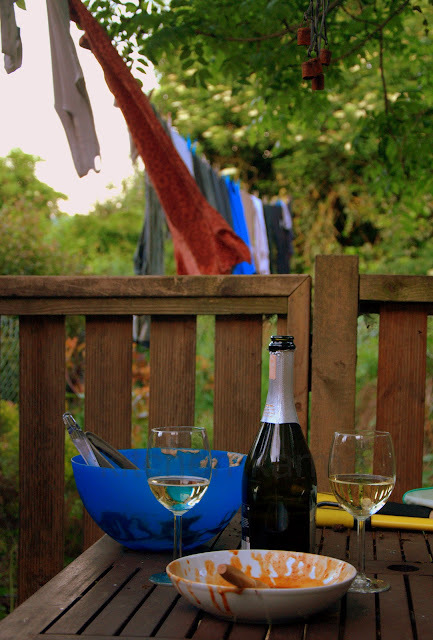 And while the meat was grilling, they poured themselves a glass of bubbly and relaxed in the tranquil evening. The May edition of World on a plate is about grilling. A perfect topic for this time of the year. Though I am sure those in India and rest of the super heated places would severely disagree. But here in the UK we have been enjoying awesome weather and suddenly there has been a spate of BBQ dinners. 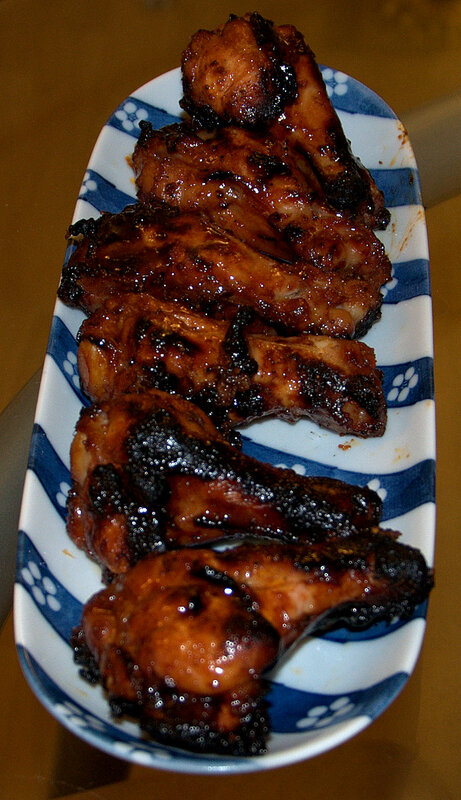 My absolute favourite among all BBQ meat are hot and sweet chicken wings which feels sticky to touch and tastes a bit hot and a bit sweet and on the whole super yummy. I do not know where I first ate it. Maybe in some Chinese restaurant back home. But it is a taste that has lingered in my favourite food list for far too long and decided to rent the top position, perhaps for ever. So when I started cooking with loads of enthusiasm, I decided to perfect my own hot and sweet chicken wings recipe. 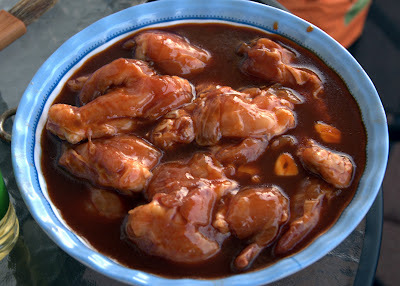 This recipe was the foundation on which I built my perfect hot and sweet chicken wings recipe. I simply cannot imagine a BBQ without this and there are never any leftovers wings for the next day. And the recipe is so simple that now I think I could make this in my dream. Just keep your 1/3rd cup ready and the rest is easy peasy. In a large bowl or plastic bag add the rest of the ingredients, mix well (the marinade will be a little liquid-y) and then add the chicken wings, make sure that the chicken pieces are nicely coated in the marinade. Keep them in the refrigerated for 24 hours. Sometimes I have grilled them just an hour after marinating them, they still taste nice, but no where near to what they taste after being marinated for one whole day. Get your BBQ ready and grill them till they are almost charred, coating with the remaining marinade from time to time. Wait till they cool a little, before you take your first bite. I have burnt my poor tongue many a times in my tearing hurry to take the first bite. Burnt tongue or no, the taste is so worth it, that everything else fades when you chew a piece of juicy chicken seeped in sticky hot and sweet sauce and the charred bits add to the perfection. So today when we started the BBQ, I realised to my horror that there were no chicken wings left. But there were some pork loin cubes. I marinated the pork in hot and sweet marinade for about an hour and it came out a treat. Midway while the pork skewers were sizzling on the grill I had an urge to eat rice. So I quickly made some fried rice and reduced some of that remaining marinade with a little chicken stock and made a sauce. Before signing off, I want to repeat (you may also repeat after me) how finger lick'n good this recipe is and so simple to make. Do give it a try. First time to your blog and I love the way you write. The juicy chicken looks so good and I am sure it would have left your guests lick and enjoy its taste even after they were done. They looks sticky, sweet and spicy. Yum! oh, how beautiful are your pictures!!! those wings look so delicious, I bet they were absolutely perfect! Those chicken wings look mouthwatering Suchi! Thanks for sharing the recipe, the chicken wings look delicious and moist. Wow! Those wings look goooood!!!! I'd love to eat some and then lick my fingers!! I know what you mean regarding England's weather. These wings is the perfect way to celebrate the good days that you have there! Perfectly grilled! Oh wow, these look so good!!! MMM mmm mmm! This was a well written post. Your details really do set the atmosphere! 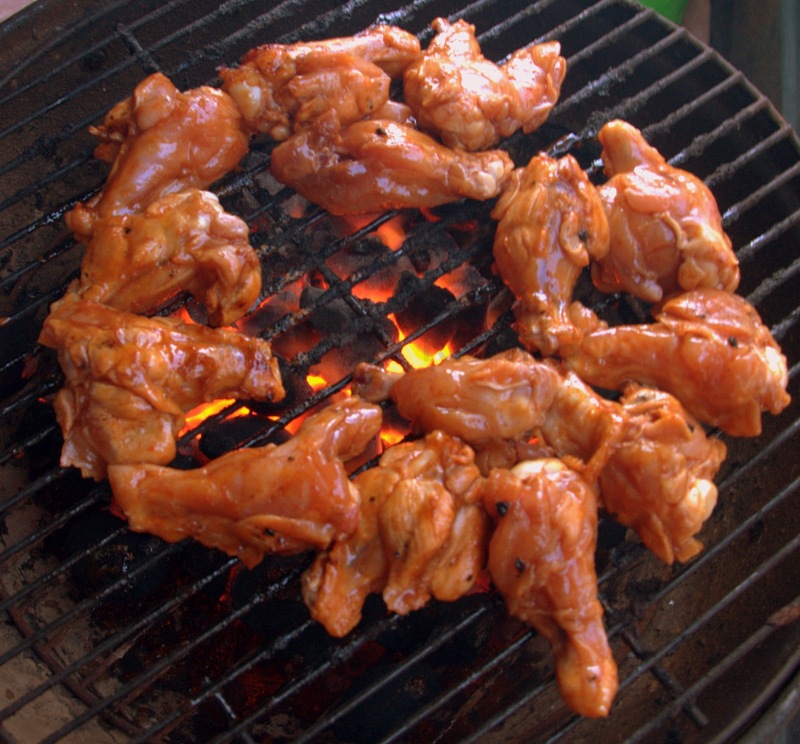 Grilled chicken wings are always a favorite and yours look delicious. I will need to try this version-yum! Goodness me you had an amazing barbecue! The chicken looks particularly invinting. Mmm... I am drooling now. 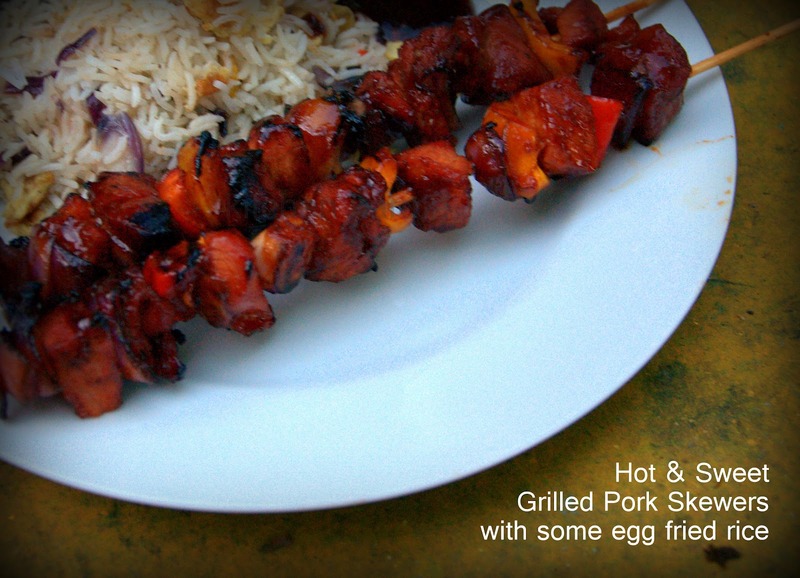 Mmmmm...your marinade looks fabulous with both the wings and pork!!! What a flavorful chicken wing,looks so perfect,,,Yum,great ingredients,welldone !! I take your word for how finger lickin good these chicken wings are.. because they look superb. Have bookmarked. I miss the summers in UK, BBQ evening parties, the picnics in beautiful parks. People are in a good mood all the time. Wow, this chicken screams summer! It looks extremely tasty! This chicken is so delicious!Love it! Estupenda barbacoa los domingos son días felices también para nosotros...exquisito...lindas fotos abrazos hugs,hugs,desde Chile. looks so easy to prepare and delicious...mouthwatering clicks! my mouth is watering at the sight of these - those sound and look absolutely delicious! I just started drooling reading this. YUMM-AY. Hi Suchi.. I like the second photo on this page a lot.. Quite an eye ! I shall send you the invite then for the same..
Suchi, love BBQ esp chicken so will definitely try your chicken wings :) yummy. Yup,we went to Venice during this long weekend,had a good time.Hope u had a grat weekend too ! Those chicken wings look absolutely delicious! Full of flavors. Thanks for the great recipe! the chicken looks just so juicy and tempting...lovely snaps!